I think we've ALL (well, at least I have been!) waiting for a full coverage foundation from Milk! 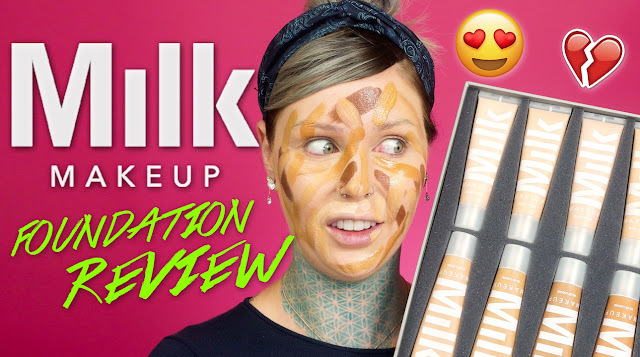 They have such great quality and innovative products, however many of them don't have enough BANG for me as they're quite subdued and natural, so I'm really excited to review the FULL COVERAGE foundations with you guys! After editing this video, I did come to the conclusion that I think there should be more of a variety in the darker shades. There are only around 4 shades for dark skinned women & men, when I really feel there should be more, as dark skinned women & men have a wide range of slight skin tone differences as well whether one is a bit more on the yellower side or one is right in the middle. Maybe they are planning on adding more to the range, which would be great! What has been your FAVORITE foundation that you've ever tried? !